It’s asparagus season, so make the best of it! Fresh asparagus is fine steamed (for about 5 minutes, till it’s bright green and tender but not mushy) — but it’s even better roasted! Look for medium-thick stalks that are firm and unwrinkled. Avoid any bunches that have moist tips. The easiest way to prepare asparagus for cooking is to simply snap off the hard part at the bottom by bending it with your hands — it will snap in the right place. 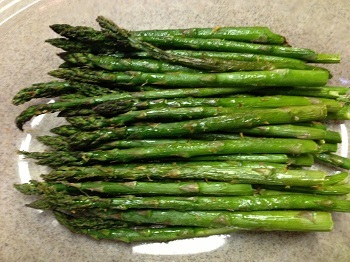 I sometimes vary this recipe by sprinkling the asparagus with a mixture of spices instead of the garlic and lemon peel. I have a great one that I got in New Orleans called Joe’s Hot Stuff (with a husband named Joe, how could I resist?). It includes garlic, paprika, red pepper and thyme. Trader Joe’s “21 Seasoning Salute” is also good. If you have very thin stalks of asparagus, they will take less time to cook. Remember, overcooking asparagus is worse than undercooking! If you have any asparagus left over after your dinner, cut it up to use in an omelette or salad. Preheat oven to 425 degrees (if you’re already cooking something else in the oven at a lower temperature, you can do the asparagus at the same time, just plan to cook it a little longer). Wash asparagus and snap off the hard bottom part. Line a large baking pan with foil and lay the asparagus on it in a single layer. Drizzle with the olive oil. Sprinkle the garlic powder and lemon peel over the asparagus. Roast for about 8 to 10 minutes, turning once during the cooking. You should be able to pierce the asparagus easily with a fork, but it should still be firm, not mushy. It might brown slightly; that’s OK. I know I posted a Passover granola recipe not all that long ago. 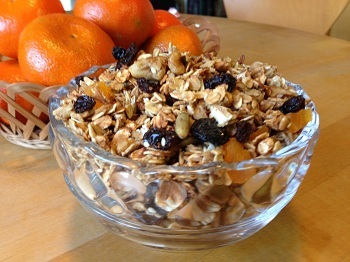 Now I want to share my all-year-round granola recipe! I was going to include a link to the B&B, but alas it has closed – the owner decided to concentrate on her landscape business instead. But she told me via email that she still makes this granola and eats it every day! Judith’s original recipe made twice as much. I find that this amount suits the two of us fine. It fits on a single baking sheet in the oven, and it lasts well stored in an air-tight canister. We like to sprinkle a little bit on the top of regular cold cereal or mix it with fruit and yogurt. It’s also good to eat as a snack. If you put it in a pretty glass jar or a fancy plastic bag tied with a nice ribbon, it makes a dandy hostess gift! Mix honey and apple juice in a glass bowl or measuring cup and heat in microwave until hot (about 1½ minutes on high). Combine all other ingredients except the raisins or other dried fruit in a large bowl. Pour the hot honey-apple juice mixture over the oats mixture and stir well until the oats are evenly coated. Let this sit for 5 to 15 minutes so the oats can absorb the liquid and swell a bit. Preheat the oven to 325 degrees. Line a large baking sheet (the kind with sides) with foil or parchment paper and spread the oat mixture out on it evenly, breaking up any very large clumps. Bake for 20 minutes, then stir it on the sheet (the mixture at the edges may brown faster than the rest, so move it from the edges to the center). Bake for another 15-20 minutes until the granola is fairly dry and lightly browned. Add the raisins and/or other dried fruit and mix. Cool thoroughly and store in an air-tight container. I can’t remember where I got this recipe, but I’ve been making it since I lived in Philadelphia eons ago. You can fool yourself that you’re eating something healthy — after all, they’re full of oats, nuts, raisins and peanut butter. And they taste great too! I like to use crunchy peanut butter to give them an extra crunch. You can substitute dried cherries or cranberries for the raisins, if you like. Preheat oven to 350 degrees. Beat butter or margarine and sugars together until creamy. Blend in eggs, orange juice or milk and vanilla. Sift together the flour, soda and salt. Add to the butter mixture and mix well. 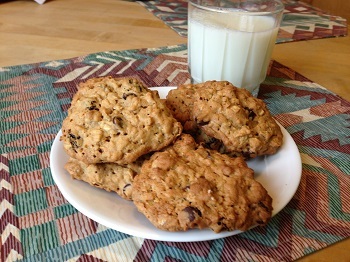 Stir in the oats, chocolate chips and raisins. Drop by tablespoonfuls onto ungreased cookie sheets. Bake for about 15 minutes until lightly browned. Cool on wire racks. Serendipity! Not only did I discover a recipe I really wanted to try but I had all the ingredients on hand, including some unusual ones that I was wondering how to use. Those of you who have been reading this blog from the beginning may remember that I started it as part of the process of getting my recipes in order. I had a 4 x 6 index card file, started soon after Joe and I married. When that filled up, I started putting clippings and copied recipes in an accordion file divided into salads, soups, pastas and grains, poultry, etc. Then there was a manila folder with all the clippings I hadn’t had time to sort into categories for the accordion file. There were hundreds — maybe thousands! — of recipes, some of them more than 30 years old. Some were old favorites and some I had never made. So far I’ve made it through the card file and about two-thirds of the accordion file. I have input more than 230 tried-and-true recipes into my online collection. The bulging manila folder still awaits. Today’s recipe is one of those I had never made before but that looked worthwhile. It came from some magazine or other; the only identifying information is “1997” at the bottom and a note that says the recipes (there must have been others in the article) were from Michele Peters and Cynthia DePersio. The recipe is a bit complex but not difficult. Measure out all the ingredients at the beginning and the actual cooking will be a snap. The recipe calls for “chicken cutlets” and I used boneless, skinless chicken breasts instead, so it took longer to cook than the recipe says — about 8 minutes on each side. When I make it again, I’ll cut the breasts in half horizontally and pound them thin so they’re more like cutlets. The recipe also calls for cooking in a grill pan, which I don’t have — and it’s still too cold in Michigan to grill outdoors. I probably could have broiled the chicken breasts but I decided to cook them in a regular (not cast iron) skillet on the stovetop, and so I used a couple of teaspoons of oil at the beginning to get them going without sticking. I think grilling would give them a browner color that would provide more contrast with the white sauce. We didn’t have a box of couscous, we had a 2-pound jar. I measured out 10 ounces, which the recipe calls for. This makes an enormous amount of couscous — more than we could eat in four servings. If you’re starting with bulk couscous, you may want to use 8 ounces instead of 10. (It would probably absorb the same amount of liquid — or you could cut back a little on the chicken broth. Of course the couscous is good left over too, even if there’s no more chicken to go with it! I think this dish would be equally good using rice instead of the couscous. Cook it as a pilaf with the same spices, using the coconut milk in place of some of the water you would normally use to cook it. 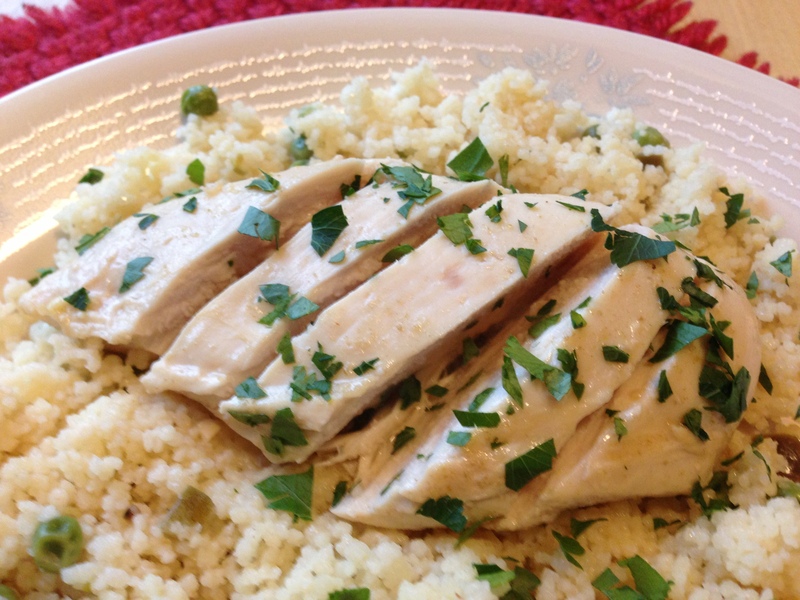 Prepare ingredients for the couscous – but the cooking will take only 5 minutes, so you might want to hold off on the final step until you start cooking the chicken. Heat the oil in a medium saucepan over medium heat. Add the ginger, garlic and 1 tsp. minced jalapeno and cook 1 minute. Stir in 1 cup coconut milk, chicken broth, peas and salt; bring to a boil. Stir in the couscous and 1 Tbs. lime juice, remove from the heat, and let stand, covered, for 5 minutes. Heat a grill or a cast iron skillet for the chicken. Combine the remaining coconut milk, 2 Tbs. lime juice, 1 tsp. minced jalpeno, cumin and salt. Pour ⅓ cup of the mixture into a shallow dish and add the chicken, turning to coat. Reserve remaining sauce. Cook the chicken on the hot grill. If you use a non-cast iron skillet instead, heat it with 2 tsp. of oil at this point. Cook the chicken, turning once halfway and brushing with the reserved sauce. If you need to do this in two batches, keep the first batch warm on a covered plate. Fluff the couscous with a fork and spoon onto dinner plates. Slice each chicken cutlet and arrange in the center. If you have any sauce left over, bring it to the boil and pour it over the chicken. Sprinkle with the parsley. I adapted this recipe from a recipe I clipped from the Detroit Free Press, whose food editor adapted it from Fine Cooking magazine (November 2001). It’s a nice, hearty soup – serve it with a salad and some crusty bread and you’ve got dinner! It’s great for a dreary, rainy, not-quite-spring day like we have today in Detroit. Warning: it’s quite garlicky, so make sure everyone in the family eats it — and don’t breathe on anyone who doesn’t! In a large saucepan, heat the olive oil and sauté the garlic and onion until fragrant, about 3 minutes. Add the broth, water and tomatoes (with the juice) and bring to a boil. Add the tortellini and cook over low to medium heat until the pasta is tender. Reduce heat to a simmer. 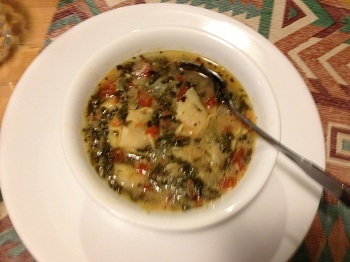 Stir in the spinach and basil; if using fresh, cook until they are wilted, about 2 minutes. In a small bowl, whisk together the egg and Parmesan cheese. Drizzle the egg and cheese mixture into the soup and cook, stirring, for about 3 minutes more. Season with salt and pepper to taste. This has become one of my trademark recipes, though I can hardly claim to have invented it. I think the first time we ever ate it was at the home of Paul and Sharon Levine — either before their kids were born or when the eldest was a baby, so we know it’s many moons ago! Then I found a recipe in Real Good Cookin’ Y’All, a cookbook put together by the Houston chapter of the National Council of Jewish Women, where my mother was a member. I have adapted this recipe from that one. My kids love it, and so I usually make it when they are visiting, often for a holiday or special occasion. I made it last week for the first Passover seder. 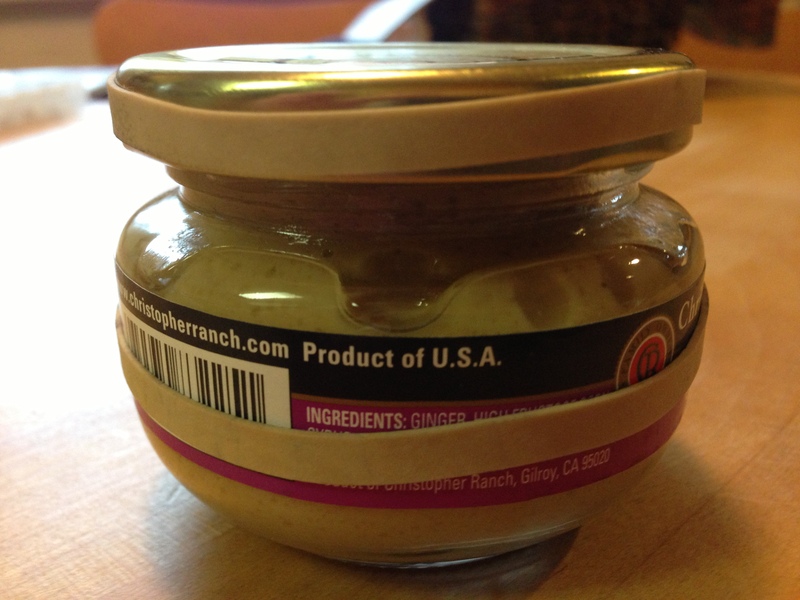 The recipe calls for Wishbone Russian dressing, which is not the mayonnaise-based Russian dressing, but is oil-and-vinegar based and dark red. If you can’t find it, or prefer to use a low-fat dressing, you can use any red French dressing. This recipe works fine with low-fat dressing and reduced-sugar apricot jam. If you have a big container of onion soup base, rather than packets, use enough of the dry mix to make 4 cups of soup. If you want to make only one chicken, make all the sauce and use half of it; save the rest in the refrigerator for another time. Preheat oven to 325 degrees, or 300 degrees for a convection oven. Combine all the ingredients except the chicken pieces. Place the chicken pieces in a single layer in a baking dish, skin side down. Pour the sauce over; use a spoon to make sure all the pieces are totally coated with the sauce. 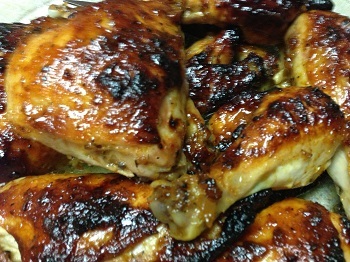 Bake for 40 minutes, then turn the chicken pieces over and baste with the sauce. Continue baking another 45 minutes to an hour, basting every 20 minutes, until the skin is nicely browned.